Roberto Saviano's 2006 book Gomorrah explores the vast reach and corruption of the Camorra. 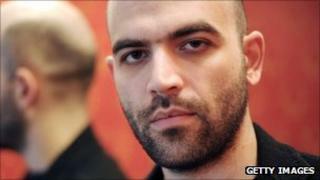 Mr Saviano, 32, has lived under constant police protection since death threats were issued against him by the mafia in 2006. He is sharing the prize with British playwright Sir David Hare. The Pen/Pinter Prize was established by the writers' charity Pen in 2009 in memory of British playwright Harold Pinter. Each year a British writer receives the award alongside another writer who has been persecuted for expressing his or her beliefs. The identity of the "writer of courage" is announced at the ceremony. "Roberto Saviano took on the Neapolitan mafia, first in the novel Gomorrah and then in the film made from it," Sir David, 64, said at the awards ceremony in London on Monday. "He did so at great risk to his own safety. My hope in sharing my prize with him is that a measure of recognition from Pen may, in however small a way, make his life easier." Mr Saviano, now living under 24-hour police protection, sent a message expressing his gratitude. "When you feel that so many need to see, to know and to change, and not just to be entertained or comforted, then it is worth it to carry on writing," he said in a statement released by organisers. Gomorrah has been translated into 53 languages and remained in the bestsellers list for several weeks after its release in 2006. It sold 2.5 million copies in Italy alone and a further four million around the world. In 2009 he released his second book, Beauty and the Inferno, which was a collection of articles written mainly whilst in hiding. Sir David's notable works include Plenty, a portrait of disillusionment in post-war Britain, and The Absence of War, a drama about the British Labour Party.